I suppose a let-down in the Rapp series had to happen sometime. 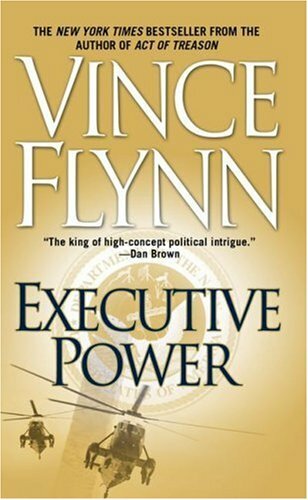 With much anticipation, I picked up _Executive Power_ expecting a Mitch Rapp energized by current world events: 9/11, WMD's, Afghanistan, Iraq? None of these topics even play a bit role in this book. Rapp is back, working in the CIA office and domesticated as the husband of Anna Rielly. I soon found myself skipping over pages that mentioned their marital issues. Rielly's relationship with Rapp is unfailingly boring and even Irene Kennedy's initial conflict with Rielly over her husband's job turns into a syrupy feel-good relationship. Argh! The main thrusts of the book are a kidnapping of American tourists by Philippine separatists and a plot by a Saudi prince and a tough Palestinian assassin ("David") to force the creation of a Palestinian state. What these two threads have to do with one another, I have yet to figure out. Both are disappointly executed, other than the highlight of the entire book: a Rapp-led SEAL attack on Philippine terrorists. With all of the great, current-events fodder for Flynn to work with, his choices of a relatively unexciting Philippine separatist group and the machinations of an obese Saudi prince seem, at best, mediocre. We can only hope that an assassin whacks Anna Rielly and sets Mitch Rapp off on a "Creasy"-like* revenge extravaganza. A page-turning novel of international intrigue. The Weakest of his 6 books, but still a fine read! I have all of Flynn's books, and this one is the weakest of them. Flynn is usually heavy detail and does a great job plugging in all the gaps in the sub-plots, but this book falls a bit short of the previous standards in his stories. I'm not beating up on him, because he is my favorite writer(i've read all his books 3 times.) This story brings back the man that most of us guys would like to be like...Mitch Rapp. He is trying to figure out why the Isralies have apparently assasinated a couple of key Palestinian leaders, along with a Prince from Saudi. The story flows very well, but unlike in previous Flynn novels, it comes up a little short. I wonder if Flynn rushed to meet a deadline, but I might be way off....who knows? So why should you buy this book, after my negative critism of it? While it falls short of other Flynn books, it is still a very enjoyable and easy read. The story is gripping, and both men and women alike are drawn to the strength of Rapp's character. Men wanna be like him, and women wished their man was more like him. Its a very SOLID story, just the weakest of all Flynn's fine works. A Navy SEAL Team is ambushed. The evidence points to a State Department leak. An assassin financed by one of the wealthiest men in the Middle East is eliminating obstacles to a Palestinian State. Mitch Rapp, an overt CIA agent, analyzes, faces and, eventually, eliminates the challenges. Vince Flynn is a master of suspense and one can only pray that Mitch Rapp has a counterpart somewhere in the U. S. government. The hero of this superb series of political thrillers, CIA agent Mitch Rapp, has two problems to deal with. First of all, an American family is being held hostage by rebels in the Philippines. The Philippine government appears unable or unwilling to help. After a Navy SEALs team is ambushed while attempting the rescue, Rapp decides to attempt the rescue while exacting revenge on those who are responsible for the leak causing the ambush. The second problem concerns a Palestinian assassin attempting to force Israeli concessions for a rapid peace by taking out top Arab leaders while making it look like the Israelis are involved. The question is: who is the assassin and who is he working for? The result of his actions might lead to war. This is my first Vince Flynn. Having no series context with which to evaluate assassin Mitch Rapp and wife Anna Reilly, I think this potentially great story was weakened by their marital interactions. Mitch came across as a strong, cold-hearted, somewhat arrogant killer in the field and a henpecked, battered wuss at home. It was highly incongruous that just the sight of the fearsome Rapp makes a male ambassador's knees knock, yet Rapp meekly tolerates a shiner from his own wife. To make matters worse, his wife and his female boss join forces in the nagfest. I'm ready for the next one! As always, a great stand-alone story. However, if you're familiar with all of the Mitch Rapp stories and characters, you'll enjoy it even more. So happy to see Scott Coleman back, he's one of my favorites. I was hoping Donatella would make an appearance...maybe next time. Mitch Rapp is someone we hope exists. He's a dedicated federal government employee charged with fighting terrorism in the top-secret Orion unit. Rules and laws are to be tossed aside when Rapp fights terrorism: results, the extinction of the threat and the enemy are all that counts. Flynn's Mitch Rapp is a delight. In "Executive Power," a shadowy Palestinian is determined to cause world-shaking changes. A man of many names, "David" has enlisted the sponsorship of a fabulously wealthy Saudi prince to move his sinister plans ahead. But David also works with Israeli intelligence, Palestinian terrorists and anyone else who will help advance his cause. David is a reuluctant murderer, but murder he does on a global scale. Hebron, New York, Washington all have corpses littering their street. Rapp spends much of the novel avenging the deaths of two U.S. Navy SEALS who were betrayed by an errant State Department employee, an ambassador and corrupt Filipino general. Flynn writes great action scenes. Rapp, ever the sensitive assassin, is in the thick of the action, troubled only later by concerns of his new wife. Yes, Rapp is a married man. Only compartively late in the novel do the machinations of David the reluctant murderer and Rapp, the thoughtful assassin, intertwine - and at that point David becomes prey to Rapp. If, of course, Rapp can acheive small wonders, such as identifying David and then finding him. Flynn is a master at building suspense. His plots are tightly woven and although they depend on a great deal of fortuitous coincidences, they work. Rapp is definitely a super-hero, but not a bombastic one. He is the kind of person we all sincerely hope exists in the U.S. government, protecting us from the nation's enemies. Great, fun reading for the lover of thrillers. Once again Vince Flynn takes us into the world of a CIA secret operative otherwise known as an assassin. Mitch Rapp leads us through another fun, fast paced adventure as he travels the world hunting down the terrorists that threaten America's safety. The story started out so, so promising. Unfortunately, it got lost somewhere along the way. Almost like it was exposition rather than serious story telling. More accurately, the book's two separate stories that were forcefully melded into each other for no rhyme or reason other than to add pages. To add insult to injury, neither story is very good standing alone. Take the Abu Sayyaf angle. Q: How does the Abu Sayyaf story relate to Omar and David's? A: It doesn't, other than that Mitch Rapp stars in both, but that's a flimsy reason if you ask me. Worse, the only character with any real depth or complexity, David, dies at the end. Seems to me Flynn's going the way of Mr. Clancy, from very good to extremely mediocre. Rapp (and Flynn) Roll On! I borrowed my first Vince Flynn book from the "library" at work. I was hooked. Vince Flynn writes about the same subjects as Clancy. I have liked Clancy from the start but he is often too nitpicky about the minutia of his subject matter, often to the detriment to the story. Whereas Flynn gives just enough detail to lend credibility to his writing. Nobody doubts Clancy is an insider in the community and Flynn leaves no doubt he is one too. Saddened I didn't wait to borrow this book!!!!!!!! This book is entertaining and fast-paced; however, I do agree that the two plots in the story are completely unrelated and throws the reader back. I think the hostage plot was an attempt to fill space and to build Rapp into a more of a macho hero. Of the two plots, neither is fully developed. The Palestinian/Israeli conflict is more interesting. David's character is fascinating and an equal match for Rapp. I was expecting the climax to be some kind of David/Rapp faceoff, which never happened. This was a disappointment. The ending was a cheap shot, it's as if Flynn didn't know how to end the book. At the end the reader feels manipulated. I love the Mitch Rapp character but in this book, he is at times, too over the top. He makes everyone seems moronic. And what is that fear he has of his wife? The thumbs up from Dan Brown on the front cover enticed me to buy this book in addition to the fact that the book was considered to be a post 9-11 thriller. I almost expected the book to flow like the 24 Hours TV Series, but instead it turned out to be a jumble of different sub-plots that really didn't flow well at all. Some of the characters / sub-plots (Phillippines, the love story) didn't come together quite well. The "hero" was a little too macho and not too likeable. It seemed like the author ran out of steam toward the end. My fav character: Prince Omar! Veteran voice performer Armand Schultz gives a tense and gripping reading to the latest political thriller from Vince Flynn. Following "Separation of Power" Flynn delivers another straight from today's news dynamite story. Mitch Rapp, CIA superagent, can no longer work underground. He was at the head of a commando group that infiltrated Iraq, then received worldwide press coverage when he was acclaimed for his valor by the President. Now Rapp is battling terrorism from behind a desk at CIA headquarters where he is an advisor to the Director. He won't be desk bound for long after he learns that some Navy SEALS dispatched to the Philippines to rescue a kidnaped American family have been caught in a deadly vise. How did our enemies know the SEALS were being sent? Supposedly, this was top secret information. How can Rapp work when his identity is known to all? Thanks to Vince Flynn there's another astounding, authentic tale to set pulses pounding. Vince Flynn's latest thriller has government assassin Mitch Rapp taking on terrorists in a novel that is unevenly paced but is nonetheless a fun read. The plot has a Palestinian terrorist named David creating an escalating series of events with the intent of forcing the creation of a Palestinian state. While in certain ways a man of integrity (he does not directly target innocents), he also is aware that his acts will beget additional, less discriminate violence. Meanwhile, Rapp is off in the Philippines, taking on different Islamic terrorists who are holding a family hostage and have already killed members of a previous rescue mission. Flynn keeps things moving, but the big flaw in the story is the pacing. The rescue/revenge mission in the Philippines is clearly a secondary (and independent) plot, yet it dominates over half the book. By the time Rapp gets involved in the main story, it is already around page 300. That's a long time to get the story to kick into full gear, and it's only Flynn's adept writing that is able to overcome this problem. Vince Flynn is simply fantastic! My dad, who is 84, my wife and I all just finished this book. And each and every one of us LOVES Vince Flynn novels. My wife usually dawdles through a book taking months, I kid you not, to read a book. Vince Flynn books, on the other hand, she literally devours and this one was no exception. My dad finished it in three nights. I have now finished reading ALL of Vince Flynn's novels and not one has disappointed. I just love Mitch Rapp. He's a terrific character unburdened by the PC constraints that are crippling our current anti-terrorism efforts from the presidency all the way down. The remarkable thing about Mitch Rapp is that this outrageously un-PC protagonist was conceived BEFORE 911!! We are introduced to Mitch Rapp in Transfer of Power, written in 1999, and he is fighting and killing Islamic terrorists at least two years BEFORE 911. While most of us were contentedly sitting back and enjoying our lives oblivious to the extremes to which Islam and its adherents would eventually take us Vince Flynn's Mitch Rapp was fighting the good fight. To say that Vince Flynn was prescient would be an understatement. The book starts out with two Navy seals getting killed because of the loose lips of American diplomats. Mitch has apparantly abandoned active undercover work at the request of his beautiful wife, Anna, but unfortunately for her (and fortunately for us) Mitch is drawn back into the world of espionage to avenge the lives of the two seals. He eventually tracks down the leak that caused the deaths of the Navy seals and takes care of the problem in a typical Rapp fashion. His confrontation with the State Department bureaucrat is priceless. Another story line develops from the beginning which is unrelated until the very end of the book. A renegade Saudi prince enlists the help of a Palestinian, David, to carry out various assassinations to drive a stake between the Israelis and the Americans. Robert Hays is a centrist Democratic president, unlikely to say the least in today's political environment. Not since Truman, and possibly Kennedy, have we witnessed such a political animal as a centrist Democrat in the White House as Hays. This is the first of Flynn's books I've read, but it certainly will not be the last! Former CIA insider turned author Vince Flynn holds nothing back, and after reading Executive Power I feel like I myself was the spy and government assasin. I've read other thriller novels by other authors, but NONE has ever matched the level of authenticity, reality, and gritty detail. Our main charector, Mitch Rapp, is a top level CIA agent who's main job is ending the lives of real nasty people. He's a real old-shool, hard line, no-nonsense kind of adventurist with little tollerance for self inflating politicians who have no idea what life is like on the front lines. In fact, if this book has one flaw (note I said IF) it's that Rapp is a little too super human. But hey, considering how much fun the entire experience was, I'm more then willing to suspend my disbelief and accept Rapp for the hero that Flynn wants him to be. Let's face it, there are people like this in our military/ops community and whether you find him to be a jerk or whatever, just remember he's on our side. Flynn hit the nail on the head with his descriptions of the Department of Homeland Security. A whole bunch of GS 13's and higher with next to no experience trying to sound like they are experts at a war on terror in which the United States has (really) only about 4 years of experience in. The dialogue can be a bit tedious at times. For instance, by page 144 Rapp has already referred to himself as a 'Pragmatic' person 4 times. Sorry Mitch, but nothing in the government is Pragmatic. Good action novel, but in many ways the characters are too far fetched to be taken seriously. The problem with thrillers these days is that so many are dreadfully formulaic. Superman type hero, crazy assassin killer, throw in some geo-politics and international locales, and you have your modern thriller. A few authors today know how to buck this conventional trend, and Vince Flynn used to be one of them. Term Limits, his first novel, was an extremely exciting and unique book with a really engaging storyline. His next couple of efforts were also top notch, as they introduced the character of CIA operative Mitch Rapp, who brought along quite the colorful assortment of enemies. The publishers were pushing Flynn as a Daniel Silva type superstar, and I waited with much anticipation for the further adventures of Mr. Rapp. Instead of another intriguing addition to the saga of Rapp, Executive Power is a barely readable bore of a book. With this tome, we find Mitch Rapp as a horribly conventional type of CIA officer. Fresh off his daring exploits in Iraq, Rapp is a now a nationally recognized celebrity. Even worse than that, Rapp has gotten married, a plot point that annoys the reader to no end. Agent Rapp, or "Ironman", was a great character because of his loner personality and his deadly ferocity. Now we find him cooking pasta for his returning wife. Of course, Flynn finds some exciting things for his domesticated hit man to do, but it is just not the same. Well, I thought, maybe the storyline can carry the new characterization of Rapp. Failure again. Two story arcs struggle throughout the 377-page work, searching for some kind of synchronization and sophistication, but they never even get close. The minor arch deals with fighting terrorists in the Philippines, a story which never even peaked any excitement from this eager reader. It seems like Flynn got bored with that tale, and moved on to one concerning the Israeli-Palestinian conflict. The villain in this one is the mysterious Palestinian terrorist known as David (ironic, huh?). David has some kind of amazing plan that he only hints at at first, and by the time it is revealed in all its illogical glory, the reader barely cares anymore. Never mind the fact that the story and the plan make little sense, it is just lackluster writing anyway. This book has a lot of problems. The first is that Middle Eastern thrillers these days have to rise above a certain threshold of believability these days, and Executive Power fails to even approach it. Even an amateur student of current events should recognize the flaws in a lot of the plot "twists". The characters are a very tedious bunch, with Rapp's new wife leading the pack of wearisome cutouts. She is the hip network reporter who will not stand for her husband's lies and wants the scoop on everything he does. How original. The President's chief of staff is a conniving operative who will sell out her country in order to protect her career. Come on Vince, now you are just copying yourself. We have the mysterious assassin/terrorist, and his drunken billionaire Saudi sponsor. Little insight into the motives or background of any of these characters is given, and the reader could care less how they end up. The dialogue throughout the story is uninspired at best, cringe worthy at worst. Mr. and Mrs. Rapp deliver some of the most ludicrous pillow talk I have ever heard. I have read all but one of his books since I discovered him. This book was kind of fun, but only when I kept my brain switched off. Clunky writing and shallow characters are expected in a genre book like this, but there were two points that really didn't work for me. First, the Phillipines and Palestinian plots were totally unrelated. Almost as if he took two incomplete book outlines and shoved them together to make deadline. Lazy lazy lazy. Vince Flynn now has to deal with the problem other authors have run into as they try and develop their characters...Mitch Rapp is married. Having a spouse can change the character. You can see it some in "Executive Power" but so far, Flynn is managing it. What I think he might have more trouble with is keeping Rapp from the action. Rapp is best when he's in the thick of things so if he takes a step back, it might hurt the character. All in all, I enjoyed the book. However, the hostage rescue storyline seemed a bit gratuitous, a way to keep Rapp in the story while the main story was being set up. The premise of "Can Middle East peace be achieved through war" is an interesting idea explored in this novel and once Rapp turns his attention to the novel's main story, it raced quickly to a great end.